Two Democratic Unionist Party MPs have told the government it is time to take a "no surrender" approach to the Brexit negotiations with the European Union. 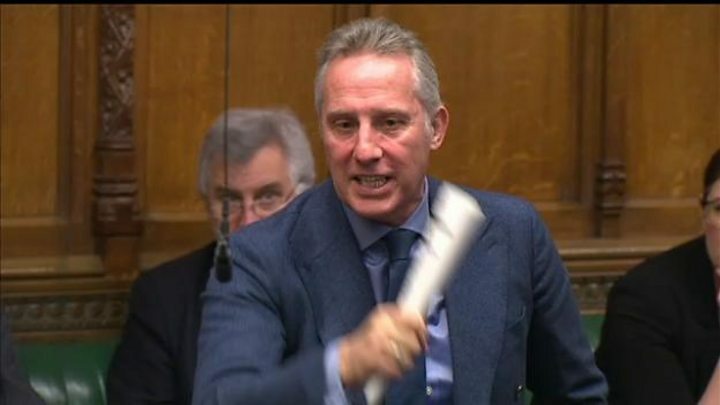 The DUP's North Antrim MP Ian Paisley accused EU bureaucrats of "bullying" and "blackmailing" the UK government over issues such as airport taxes. Speaking in the House of Commons, he told ministers to "stand up" to the EU. His party colleague, Sammy Wilson, tweeted that it was "time we went into the fray with a no surrender attitude". The East Antrim MP claimed that the "gloves are off" in the talks. "The blackmailing burghers from Brussels and the cheap political opportunists in Dublin must meet a tough UK government response," Mr Wilson added. Mr Paisley made his remarks during Northern Ireland Questions in the Commons. A government spokesman replied that Prime Minister Theresa May would "stand up to anyone and everyone when it comes to maintaining the best interests of the United Kingdom". The Conservative government relies on the support of the DUP's 10 MP to stay in power at Westminster. The "confidence and supply" deal was signed last June, after Mrs May lost her majority in the general election. The DUP, which campaigned in favour of Brexit, has at times been critical of the government's handling of the exit deal negotiations. In December, Mr Wilson warned Tory ministers that the DUP-Tory deal could be jeopardised if Mrs May agreed to a Brexit deal which would see Northern Ireland treated differently from the UK. DUP opposition to the initial wording of UK-EU commitments on the future operation of the Irish border led to Brexit talks breaking down in December. Days later, Mrs May eventually struck a last-minute breakthrough on 8 December which allowed the Brexit negotiations to move on their second phase.